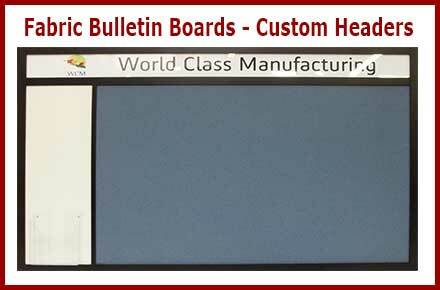 We manufacture custom fabric covered cork bulletin boards from hundreds of frame options, large velcro fabric boards, fabric bulletin boards with ribbon and custom fabric covered tackboards. We use a premium wallboard fabric to professionally cover any size tackboard. 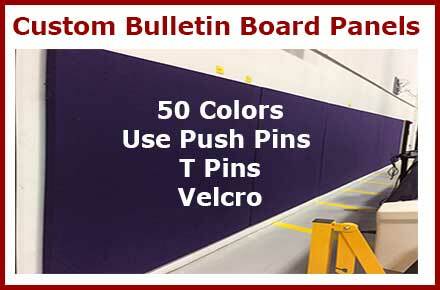 This durable solid color fabric comes in over 50 colors, has a thick texture so pin holes do not show and is fabricated so that objects can be attached to the bulletin board panels with Velcro. You can also use traditional thumbtacks, T-pins and push pins. We can even Use Your Fabric to cover a custom framed or frameless fabric wrapped cork bulletin board. Our custom tackable wall panels can be made from over 50 colors of a thick rich textured wallboard fabric that does not show pin holes. These fabric wall panels have a 1.5 inch durable internal frame and can also use Velcro. The image above is a 50 foot tackable fabric wall created for Disney Florida. 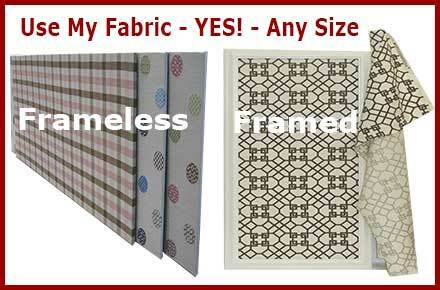 Send your fabric and we can create a beautiful custom bulletin board to perfectly match the fabric of your decor. Personalized fabric wrapped cork bulletin boards. Use your name, color, logo or unique information to create a framed fabric tackboard. 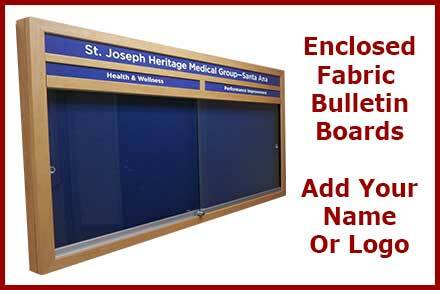 Custom Enclosed Fabric Bulletin Boards - Wrapped With Fabric - Make In Any Size. Choose any frame - Hundreds Of Frame Options - and select the Cork With Fabric Picture on that product page. 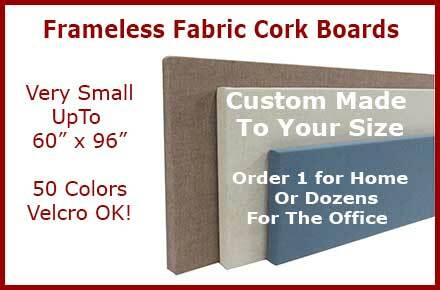 Choose your size and place the framed fabric cork board in the cart. Finally select The Ribbon And Nail Head Brads UPG202 Upgrade for your framed fabric board Contact Us we can help you make the perfect decorative Framed French Bulletin Board Design. Choose any color fabric - Over 50 Textured Fabric Color Options. 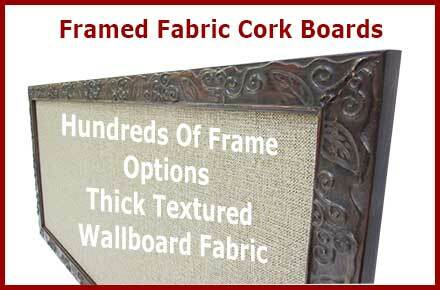 - Choose your size and place the frameless fabric wrapped cork bulletin board in the cart. Finally select The Ribbon And Nail Head Brads UPG202 Upgrade for your frameless fabric board Contact Us we can help you make the perfect decorative Frameless French Bulletin Board Design. Our fabric is used by apparel companies and the hospitality industry to support the daily needs of their operations. Interior Designers create custom combination boards for their residential clients with this popular style fabric.